If there was ever a long overdue feature in a Google app... Ok, most people probably point at a dozen other examples, including Google Voice support in Hangouts; but this one definitely belongs on the list. Support for casting presentations actually launched on the web interface at the end of April 2014, about 2 months before the Slides app even made its debut. Almost a year later, and it's still not active, but there is evidence inside of the app that gives a pretty clear sign that it's just around the corner. The new strings are the same as any other app that's adding Google Cast capability. All of the standard images are there, too. The code appears to be fairly complete, but I haven't seen a button to initiate Casting session, so it doesn't seem to be operational yet. It's possible Google is working out some final bugs, or may have decided to delay for an announcement opportunity. Whatever the reason, this one is definitely right around the corner. With the launch of KitKat in late 2013, proper printing support came to Android. 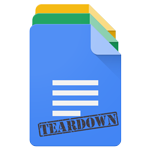 While still somewhat underutilized, many of Google's own apps can push to paper. However, it looks like there might be a desire to block the printing functionality on some devices, based on a toggle that has been added in the latest version. Note: This set of strings can be found in all three apps (Docs, Sheets, and Slides). While there's no clear reason a regular user would need to inhibit printing capability from within an individual app, my theory is that this will be controlled by network administrators within an office. At this time, the feature doesn't appear to be active, but it may only show up on devices once they are connected to a network with some form of policy enforcement. I know we're headed into the weekend, but if anybody happens to be in the vicinity of their office (or on a VPN, perhaps), it might be worth peeking at the settings screen to check for this one. Don't worry, this one isn't going to blow the surprise. But now we know what to look for. A few strings turned up to let us know of an inbound treat, care of those whimsical, light-hearted developers over at Google. The name Easter Egg has entered the scene, and it looks like we've got a brightly colored future ahead of us. The first string tells us that there will be a toast message when the Easter egg has been activated, and it's fairly obvious it has something to do with colors. The following strings indicate we just have to tap on something, possibly just the action bar, a certain number of times to enable the hidden mode. The strings aren't used anywhere in code, and it doesn't look like there are any animations or buried features to explain exactly what the Easter egg will be or how to access it – though, we can make a couple educated guesses about both. I doubt I need to spell it out, but this is an Easter-themed surprise for Easter Sunday, which falls on April 5th this year. It's possible these strings slipped out early by accident, however, they include just the right amount of information so they don't necessarily spoil the surprise, but there are enough clues to get us started. I've got a hunch the Drive team wanted to tip their hand, just to get people ready for a hunt.